During more than 20 years of teaching at Fairfield University and her time there as Director of Graduate Studies, Dr. Lange led the development of the university’s first doctoral program and the School of Nursing’s accreditation self-study. She revised the curricula of the specialty tracks and launched a Nurse Anesthesia track. Upon leaving Fairfield, Dr. Lange became the founding Dean for the Quinnipiac University School of Nursing. Throughout her 7-year tenure at Quinnipiac, she led the efforts to increase interprofessional education, update the Nursing curriculum, establish a state-of-the-art simulation lab environment, develop a nurse anesthetist doctoral program, RN to BSN program, and a master’s in Operation Leadership program. In addition to the several new programs that were launched, enrollment nearly doubled, fostering the school’s national reputation. She led the school in designing a strategic plan to build strong partnerships to ensure a high-quality education for all students. Dr. Lange worked with colleagues to design an interdisciplinary model for international studies in Nicaragua and Dublin, providing more opportunities for students to broaden their understanding of health around the world. Under her direction of team-based scholarship, faculty publications, grant applications and awards nearly tripled. Dr. Lange is a highly esteemed scholar in gerontological education and end of life matters. She has been awarded more than $1 million in funding for her research centered on the care of vulnerable populations. Dr. Lange and her colleagues created one of the first programs in the country to integrate the End of Life Nursing Education Consortium curriculum at graduate and undergraduate levels and her leadership in refining the ELNEC-Knowledge Assessment Tool has been adopted for use by educators nationwide. Her more than 100 publications, presentation, keynote speeches and national awards, truly speak to her impact on the field of nursing and education. In 2002, Dr. Lange’s work as principal investigator of a John. 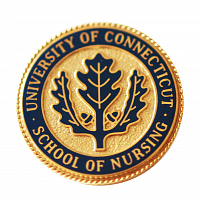 A Hartford Foundation grant earned the 2005 AACN national award, “Model of Gerontology Curricular Excellence.” In 2006, she received the UConn School of Nursing Marlene Kramer Outstanding Alumni Award for Research in Nursing, in recognition of her continued contributions to her field and advanced research education. In 2010, she received the End-of-Life Nursing Education Consortium award, a national honor given by the American Association of Colleges of Nursing to individuals deemed central to improving palliative care in America. Dr. Lange has always been actively involved in state and national task forces, including, but not limited to, the Greater New Haven Chamber of Commerce, Hartford Healthcare System, the Gertrude Skelly Foundation, the CT League for Nursing’s Faculty Advisory Board and the Eastern Nursing Research Society.